On August 30, 1972, the last professional wrestling card of the summer was held at the Honolulu International Center Arena. 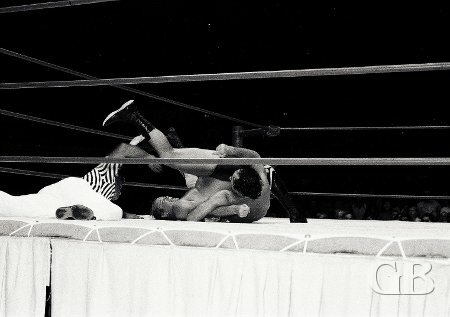 On the undercard, Sam Steamboat defeated Al Costello and Maddog Mayne topped Jimmy Snuka. Al Costello, one half of the world famous Fabulous Kangaroos tag team. Maddog Mayne with a facelock on Jimmy Snuka. In a midget tag team match, The Tahiti Kid and Little Farmer defeated the team of Sky Low Low and Little Brutus. Ring veteran Sky Low Low follows his partner Little Brutus to the ring. In a match for the AWA World tag team titles Champions Nick Bockwinkel and Ray Stevens retained their titles by defeating the team of Wahoo McDaniels and Wild Fred Curry. Ray Stevens body slams Wahoo McDaniel. 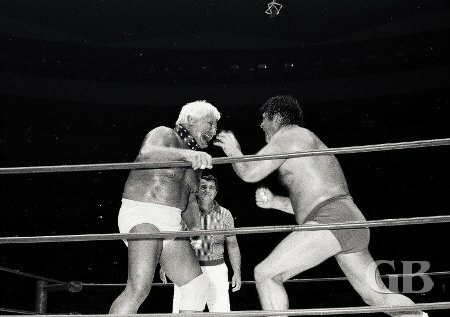 The match between Ed Francis and Freddie Blassie was one of the highlights of the evening. 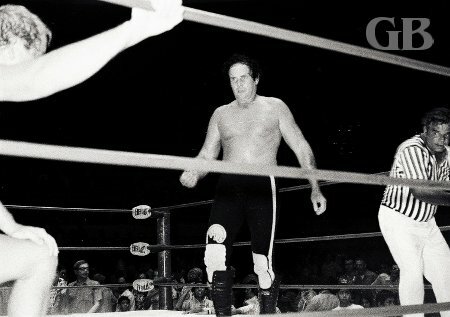 At the start of the match, Blassie was escorted to the ring by Maddog Mayne. Once in the ring, Mayne started putting a collar around Blassie's neck. This was done to prevent Francis from applying a sleeper hold on Blassie by cutting off the blood flowing to his head via the neck. Maddog Mayne straps on a dog collar to Blassie's neck to prevent Francis from using his Sleeper Hold. Ed Francis attacks Fred Blassie, who's still wearing the dog collar. The action in this match was action from the start. During the match, Francis managed to get the collar off and as Francis was applying the sleeper hold, Blassie got loose and exited the ring. Francis seeing this went after Blassie outside the ring and applied the sleeper hold on him. As Blassie was going under, the referee rang the bell and both wrestlers were counted outside the ring and the match was declared a non-contest. Blassie heads for the ropes to break Francis' headlock. A messed up Ed Francis stumbles around the mat in the corner. The main event was for the NWA World Heavyweight Championship with Dory Funk Jr. putting his title on the line against Handsome Johnny Barend. After each wrestler gained a fall, neither wrestler could win the third and deciding fall and time ran out and the match was declared a draw. Thus Funk retained his NWA title. 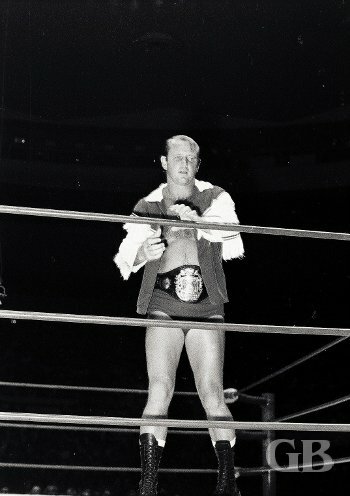 Dory Funk Jr., the reigning NWA World's Heavyweight Champion. Funk and Barend test each other's strength. 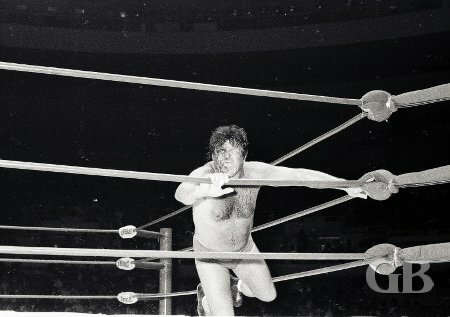 Barend tries to tie up Funk in the ropes. 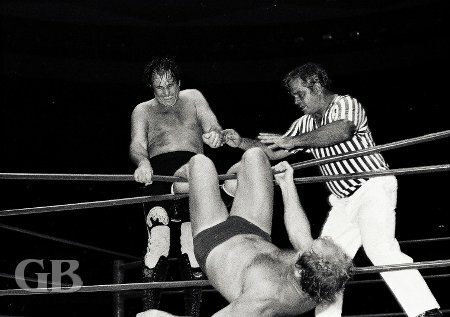 Johnny Barend attempts to pin Dory Funk Jr.
Johnny Barend appearing in what is to be his last match in Hawaii. One note of interest: the outcome of this match was the fact that it was Johnny Barend's last match in Hawaii. It was rumored that Barend suffered a chest injury that ended his career in professional wrestling. 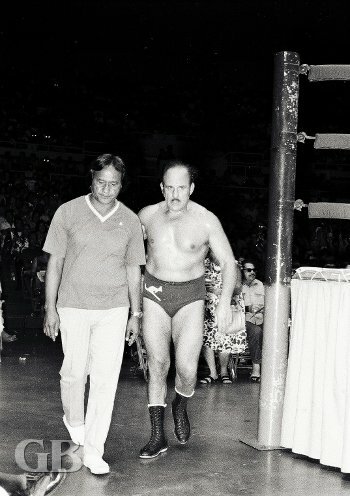 Barend was scheduled to defend his North American Championship against The Sheik on October 11, 1972 but was unable to appear due to an injury. Barend never wrestled in Hawaii again.